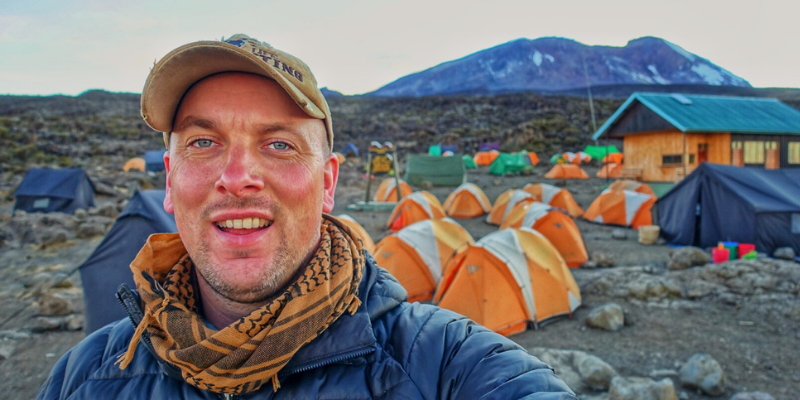 St Clare supporter and dedicated son, Dan Mackay, climbed Africa’s iconic Mount Kilimanjaro in aid of St Clare in October 2018. Inspired by the care his mum received from the hospice in December two years earlier, Dan wanted to give back to the charity and raise vital funding so that others could access our care in the future. Dan’s moving account of his adventure is captivating, exciting and inspiring! I think I could probably write a book about my experience of taking on a challenge for charity if I put my mind to it! I experienced so many different things on my travels, and made memories that will last a lifetime. On Tuesday 16th October 2018, I embarked on an adventure to climb Tanzania’s Mount Kilimanjaro via the renowned Northern Circuit to Uhuru peak. Kilimanjaro is Africa’s tallest peak, towering over the landscape at 5,895m above sea level! In total, the trek took nine days. I climbed 65km over six days to the summit, and descended 21km over three days. Why take on a challenge for charity? I took on this challenge because I wanted to raise vital funding for a charity that is very close to my heart: St Clare Hospice. In December 2016, St Clare cared for my mum when she needed them. They extended their care and support to the family, too. After a very, very bravely fought battle against an illness that plagued her for many years, my mum Barbara passed away at St Clare. Although it was such a sad time, St Clare Hospice made it all as easy as it could be. The staff, the care, and the environment all made the experience bearable during what was such a difficult couple of days. From the first moment we stepped in, we were made to feel like St Clare was our home from home. I personally will be eternally thankful to St Clare for everything. It’s a big event in your life, when a loved one dies, and it’s a really sad time. It’s hard to explain, but I just feel a strong connection to St Clare. Knowing that it’s largely funded by donations has just made our whole family want to give back. We want to say thank you to the people who helped us and ensure that others are able to access the support we had. The whole trip was a very strange mix of emotions for me, to be honest. I was very excited to be traveling alone to a country, and indeed a continent, I had never visited before. Yet, at the same time, I was very conscious of the challenge I had in front of me, as well as the expectations of all those back at home who were supporting me! When coupled with the obvious emotions I had attached to my mum, this all became a huge melting pot of many different feelings. The group I was climbing with were 14-strong with a mix of nationalities. We had six guides, two cooks and 42 porters in our entourage, which made for quite lively camps in the evening! It was a very good atmosphere with lots of camaraderie between all of us. I struggled a little with the altitude at first. I must admit some of the headaches I had were pretty epic! My body did finally adjust to the lack of oxygen, though! However, I wasn’t the only one so that made me feel a little better! On average, we were walking for around six hours each day over a mix of terrain. Some of it was very interesting, like the rainforest at the beginning of the trek, where I was woken in the night by Colobus monkeys chatting in the trees above my tent! Other areas were a little trickier, like the alpine desert area which had a lot of broken rock to negotiate. Each day, the sun rose at 6:30am, with sunset at 6:30pm in the evening. My body clock quickly adjusted to this, so it was early nights and early mornings for most of the trip. On summit day, we awoke at 10:00pm had a brief ‘breakfast’. We started hiking at 11:00pm in the pitch black of night with head torches. The small rainy season that usually arrives in November had decided to turn up a little early for us. So, along with strong winds offering 50-60mph gusts, we also had ice crystals being blown in our faces and a wind chill of around -24C! Those hours I spent marching through the darkness in the cold were without a doubt the strangest of my life so far. It’s hard to explain the range of emotions I went through in the seven hours before the sun came up. We all walked in single file, as the paths are narrow and very steep. With the ice and darkness, this meant that chatting wasn’t really an option. So, I spent a lot of time inside my own mind thinking about many different things. I thought about my Mum an awful lot. I’m not too proud to admit that several times I was glad of the darkness to hide the tears on my face! I thought of how proud she would be of me doing something like this, and how pleased she would be about the amount of good that the money I raised for St Clare would do for others who depend on the Hospice. There were times when I felt like the trek to the summit was never ending; I would look up and constantly see tiny lights that always seemed like miles away in the distance! I admit, it was pretty soul destroying, so I stopped doing it after a while and concentrated on my feet. When I got down like this, I would focus on home, my family, my friends… And, of course, the reason I was doing it: my mum and the Hospice. It was these things that gave me the extra strength to persevere and lift my spirits back up. Then, as if in a flash, there was light on my back as the sun rose! After a few more rocky, icy steps, we were at the summit. I almost couldn’t believe it at first! It took a good while for it to finally sink in before I composed myself enough to get some pictures in my St Clare t-shirt. Which, incidentally, I got told off for by the guides as I took my coats off! My dad gave me a little something to put at the top of the mountain for Mum. I also took something with me. I carried them all the way to the top and they are buried in a little spot about 10ft away from the summit. So, in a way, my mum made it to the top of that mountain with me, and part her will always be there! For the past 18 months, this trip has more or less been my life. I made some good friends, and had an awesome adventure. I made my mum, my family and my friends proud. But, more importantly, I raised a lot of money for St Clare. An amazing, caring, charity that will forever hold a special place in my heart. These memories will stay with me for the rest of my life. I would like to thank all the people who have helped and supported me along the way. Especially my dad. He has helped me in so many ways, I can’t even begin to start explaining how much of a hero he is to me.